Al-Qaeda and ISIS are products of US and Saudi imperialism. Mujahideen fighters during the Afghan War. After the attack on Charlie Hebdo , certain liberals joined conservatives in declaring that the killer was Islamic extremism. Any suggestion of Western culpability would be inaccurate, if not immoral. “The murders today in Paris are not a result of France’s failure to assimilate two generations of Muslim immigrants from its former colonies,” wrote George Packer. They’re not about French military action against the Islamic State in the Middle East, or the American invasion of Iraq before that. They’re not part of some general wave of nihilistic violence in the economically depressed, socially atomized, morally hollow West — the Paris version of Newtown or Oslo. Least of all should they be “understood” as reactions to disrespect for religion on the part of irresponsible cartoonists . . . They are only the latest blows delivered by an ideology that has sought to achieve power through terror for decades. Yet this time around, more commentators in mainstream outlets broke from the they-hate-freedom, blame-Islam chorus. Whether because the attack didn’t happen in the United States or because the teenage “war on terror” shades the debate, or because a few more thoughtful writers now have prominent platforms, truth crept in. That counts as progress. As does CNN’s decision to run a piece by Noam Chomsky that calls President Obama’s drone killings “the most extreme terrorist campaign of modern times.” And as does Seamus Milne’s piece in the Guardian pointing out that violence like the Paris attack is an extension of Western wars. Yet these pieces are still relatively kind to the United States and its allies. They downplay the role of the West in producing the violence that its “thought leaders” blame on Islam. The truth is not merely that Team USA’s violence is far greater than that of its enemies, or that the former triggers the latter, but that Western governments and their client states have actively empowered right-wing jihadist groups. There is, however, a longstanding US effort to use specific facets of Muslim theology as weapons. This is part of a larger context that includes the European colonialism that preceded it and the American coups and wars that have sown chaos and sectarianism and undermined the self-determination of people in the region. Milne offers a familiar take: the West inflicts enormous violence on people in the Middle East, and — as Ward Churchill once put it — “some people push back.” This is true. Many of those who’ve carried out attacks in Western capitals in the name of Islam — from Dzhokhar Tsarnaev to Faisal Shahzad, the would-be Times Square bomber — cite the West’s violence as their motive. Their explanations jibe not only with common sense but with the research of University of Chicago political scientist Robert Pape, who found that by far the most significant cause of suicide bombing across the world is foreign occupation. Furthermore, only a tiny fraction of Muslims have joined right-wing jihadist groups. Attempting to bolster his claim that Islam is inherently violent, Bill Maher cites (selective) stats showing many Muslims hold retrograde views on women and gays, but this is a non-sequitur. Holding such views almost never translates into al-Qaeda–ISIS membership. In his book The Missing Martyrs: Why There Are So Few Muslim Terrorists , Charles Kurzman reports that “well over 99 percent” have rejected the call. Despite the West’s routine killing of civilians, the vast majority of Muslims oppose retaliatory attacks on civilians, and even most of those who approve of the tactic are loath to sign on with a movement that kills mostly Muslims. Beyond a fringe, Muslims don’t regard al-Qaeda-ISIS as a legitimate form of resistance to imperialism.On the contrary, many see al-Qaeda-ISIS as the spawn of US–Saudi imperialism. Here we must resort to that bane of liberals: history. The United States established diplomatic relations with Saudi Arabia in 1933 but didn’t get seriously involved in the Middle East until World War II, when it began to take over regional hegemony from Great Britain. The US relationship with Saudi Arabia deepened as Washington sought to secure its hold on the region. Throughout the Cold War, American officials tried to use right-wing militants against the two primary threats to its hegemony in the Middle East: the Soviet Union and Arab nationalism. Robert Dreyfuss lays out this history in his overlooked 2006 book, Devil’s Game: How the United States Helped Unleash Fundamentalist Islam . The great flaw of the book is that Dreyfuss, like neocons, lumps together all kinds of Muslim political practice — from Hamas to Iran’s revolutionaries to al-Qaeda — under the useless term of “Islamism.” (The American–Israeli permissiveness vis-à-vis the rise of Hamas is important but tells us next to nothing about al-Qaeda). Nonetheless, Dreyfuss makes a persuasive case, one drawn largely from the public record. Indeed, it’s almost certain that the US role in sparking the right-wing jihadist fire is even greater than the one he documents because many of the dealings were covert. In the 1950s there was a problem for the United States called Gamal Abdel Nasser, whose resolute independence was unacceptable. The new leader of Egypt was such a threat that Secretary of State John Foster Dulles took Eisenhower’s statement that “the Nasser problem could be eliminated” to be an assassination order. To try to weaken Nasser, the US wooed the Muslim Brotherhood despite — or rather, because of — its record of terrorism and violence against the state. Americans also saw anti-communist potential in its religiosity. “Either we shall walk the path of Islam or we shall walk the path of Communism,” wrote Sayyid Qutb, the group’s chief theoretician. In 1953, a covert US government program brought leading thinkers and activists from the Middle East to Princeton. Among them was the Brotherhood’s Said Ramadan, son-in-law of the group’s founder. He visited the White House that same year and would become the CIA’s man. In 1954, a Brotherhood attempt to assassinate Nasser backfired. He survived and launched a crackdown, arresting thousands. In 1956, Nasser’s popularity surged thanks to his nationalization of the Suez Canal, which led Britain and France to occupy the canal and Israel to invade the Sinai. All three were forced to withdraw, and Nasser became a regional hero. Nasser became even more popular in the 1960s on the strength of his developmentalist program. At the same time, he continued to repress the Brotherhood. Nasser’s government imprisoned, tortured, and eventually hanged Qutb, a martyr-to-be whose writings calling for violent revolution would inspire Islamic militants. One line of thinking proposes that America’s tragedy on September 11th was born in the prisons of Egypt. Human rights advocates argue that torture created an appetite for revenge, first in Sayyid Qutb and later in his acolytes, including Ayman al-Zawahiri. In the 1960s, Arab nationalism — which entailed development and redistribution, anti-imperialism, and a certain commitment to anti-Zionism — gained traction not just in Egypt but across the region, from Algeria to Palestine to Iraq. In response, the United States turned to its despotic friend. “The US forged a working relationship in the Saudi Arabia, intent on using its foreign policy arm, Wahhabi fundamentalism,” Dreyfuss writes. “The United States joined with King Saud and Prince Faisal (later King Faisal) in pursuit of an Islamic bloc from North Africa to Afghanistan and Pakistan.” To that end, Saudi Arabia formed a host of global institutions, including the Wahhabi Muslim World League, and built thousands of mosques and madrassas. Flash forward to the 1980s, when the US teamed up with Saudi Arabia to fund the Afghan Mujahideen. In the American mythos, the Soviet invasion led to US involvement; in fact, the US had been backing the Afghan Muslim Brotherhood and other right-wing proxies for years. Carter’s National Security Advisor Zbigniew Brzezinski would later acknowledge that it was their intent to trigger a Soviet invasion. 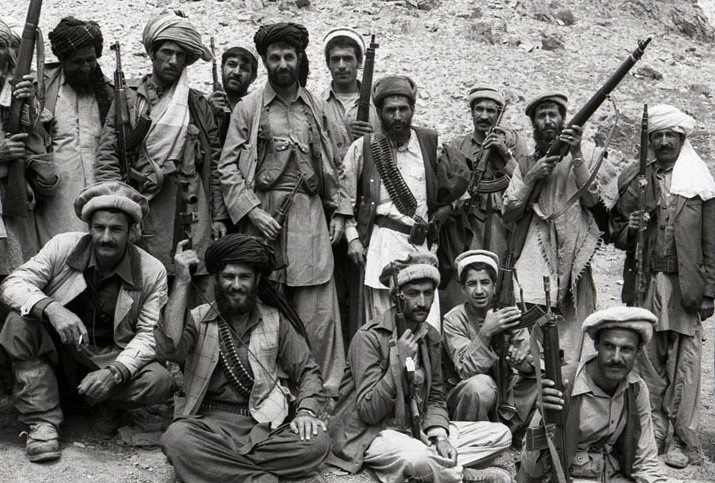 At least as early as 1972, the CIA began funding Afghan fighters. They included future Mujahideen leaders Rabbani Sayyaf and Gulbuddin Hekmatyar, who would become close to both Osama bin Laden and Pakistani Intelligence (ISI). Sayyah is believed to have invited bin Laden to take refuge in Afghanistan in 1996. In the 1980s, the bulk of US and Saudi aid went to the Mujahideen faction headed by Hekmatyar, a brutal leader whose “specialty,” Dreyfuss reports, was skinning prisoners alive. US support for such factions intensified after Sardar Daoud seized power from his fellow royalty in 1973. Breaking with tradition, he declared himself not Shah but president of a secular democratic republic. But his non-alignment — he kept his distance from both Washington and Moscow — concerned the United States, which teamed up with ISI to sponsor an unsuccessful coup in 1974. As in Egypt, the United States joined with right-wing militants to target a secular, independent government. While Daoud’s independent, moderately progressive government was a problem for the United States, the communist, Soviet-friendly government that took control in 1978 was anathema. The CIA met with and funded anti-government forces. Afghanistan became even more important to the United States when it lost its nearby ally, the Shah, in January 1979. In July, President Carter formalized authorized aid to the Mujahideen with a program called Operation Cyclone. In the fall, Prime Minster Hafizullah Amin became the leader of Afghanistan after he ordered the killing of the president, Nur Muhammad Taraki. The Soviet Union believed the CIA had arranged the coup. In December, Soviet troops moved in, killed Amin, and installed a new leader. The next sordid chapter — in which the US and Saudi Arabia funneled money through ISI to the Mujahideen and recruited Arab militants to join them — is well known, although details are disputed. Saudi Arabia deposited hundreds of millions of dollars into a Swiss bank account controlled by the United States. The new Saudi king, at the time the governor of Riyadh, was a top fundraiser, “providing $25 million a month to the mujahideen.” British Intelligence, with guidance from the CIA in Pakistan, headed the training of fighters inside Afghanistan while the US military trained Arab fighters in Egypt and, according to some reports, in the United States. Secrecy makes it impossible to know how much, if any, contact there was between the CIA and bin Laden in Pakistan, not least because each would have an interest in concealing it. We know that bin Laden formed an alliance with longtime CIA beneficiary Hekmatyar, and that ISI — the “CIA’s primary conduit” for sending money and weapons to the Mujahideen — supported bin Laden’s front organization and precursor to al-Qaeda, Maktab al-Khidamar. The people we are fighting today we funded twenty years ago, and we did it because we were locked in this struggle with the Soviet Union. They invaded Afghanistan, and we did not want to see them control central Asia, and we went to work. And it was President Reagan in partnership with the Congress led by Democrats who said, You know what? Sounds like a pretty good idea. Let’s deal with the ISI and the Pakistani military. Let’s go recruit these Mujahadeen. That’s great let’s get some to come from Saudi Arabia and other places importing their Wahhabi brand of Islam so that we can go beat the Soviet Union. During the war in Afghanistan, the West and Saudi Arabia helped create not just al-Qaeda but related groups, like the Libyan Islamic Fighters Group (LIGF). Formed in Eastern Libya by “Afghan Arabs,” LIGF tried to kill Muammar Qadhafi three times in 1995–96. British Intelligence sponsored one of the attempts, according to former agent David Shayler. Former French intelligence agents confirmed the claim and said it was this secret that led Britain to thwart the arrest of bin Laden after Qadhafi had issued (and Interpol approved) a warrant in 1998. The United States had also been involved in various attempted coups against Qadhafi — Reagan even tried to kill the Libyan leader himself in 1986. But after September 11, Qadhafi became an ally in the “war on terror,” and the United States helped him crack down on his enemies. The CIA handed over former LIGF members to Qadhafi, sometimes torturing them first. But by the time the uprising broke out in February 2011, the West had deemed Qadhafi an enemy again, and the United States was backing an opposition force that included former LGIF members fighting as the Libyan Islamic Movement. To be a right-wing jihadist over many years is to be backed by the CIA in one war, tortured by the CIA in the next, and backed again by the CIA in the next. It wasn’t popular in the United States to mention the fact that the opposition forces in Libya included extremists. The press preferred to focus on more appealing factions. To cite CIA involvement is not necessarily to deny that there was also an indigenous rebellion. The two things can coexist, and often do. What’s undeniable is that amid the chaos and carnage of post-regime change Libya, extremist groups are thriving. These include an ascendant affiliate of ISIS in the eastern city of Derna — which has, relatedly, produced an inordinate number of foreign fighters in Iraq. The rise of ISIS, like al-Qaeda’s, implicates US imperialism. It’s hardly radical to note that ISIS is the child of the US war on Iraq, a fundamental fact that tends to go missing from mainstream analysis. While violent oppression of Sunnis by the Iraqi government aided ISIS, former Prime Minister Nouri al-Maliki is too easy of a scapegoat. As Patrick Cockburn writes, it was the war in Syria that destabilized Iraq and, in turn, made ISIS a regional power. The role of the US inside Syria prior to the 2011 protests is unclear. Thanks largely to Seymour Hersh’s 2007 report, we know that President Bush urged Saudi Arabia to unleash sectarian forces in an attempt to undermine Assad in Syria and Hezbollah in Lebanon. This time the primary target was Iran, not the Soviet Union, but this was the Afghanistan playbook — still in vogue despite that intervening incident in lower Manhattan. As part of this effort, US officials cultivated ties to the Syrian Muslim Brotherhood. The plan included covert ops in Syria, but we don’t know what they entailed or how, if at all, they influenced the events of 2011, or the precise chain of events that led to the uprising becoming a war. What happened to the Syrian revolution — if, indeed, that term even applies — is disputed. We should be able to agree, however, that a progressive uprising of indeterminate size gave way to a large reactionary one as the Syrian government cracked down on leftists and foreign-backed extremists rushed in. The United States supported the uprising against the Syrian government even as ISIS became a fixture. US policy was one of malign neglect at best. We can be certain that American officials were well aware of ISIS’s rise. They accepted it in Iraq (a country they wanted to quit and whose president they no longer supported) and approved of it in Syria (a country they wanted to damage and whose president they wanted to remove or at least weaken). With ISIS now public enemy number one, it may be easy to forget that for months — until ISIS became big enough to threaten American interests — US weapons, both rhetorical and actual, were pointed only at the Syrian government. US officials gave major speeches on Syria that didn’t even mention ISIS. Saudi-Qatari-Turkish support for extremists had at least tacit backing from Washington. Documents recently published online confirm that Turkish Intelligence provided arms to al-Qaeda in Syria prior to its split with ISIS. Joe Biden’s October 2014 scolding of US allies for supporting ISIS and al-Qaeda only threw into relief the previous months of silence. More than that, the United States itself strengthened ISIS. Both President Obama and his critics on the Right now have an interest in pushing the myth that he did little to support anti-government fighters. In fact, beginning at least as early as 2012, the CIA trained opposition forces and gave them weapons belonging both to the United States and its allies. Many of these weapons ended up in the hands of ISIS and al-Qaeda. Numerous videos show that the Yarmouk Brigade has frequently fought in collaboration with JAN, the official al-Qa’ida affiliate. Since it was likely that, in the midst of battle, these two groups would share their munitions, Washington was effectively allowing advanced weaponry to be handed over to its deadliest enemy. Those who blame US ineptness are in effect arguing that American officials were unaware of public information showing it was a near certainty that arms could flow to al-Qaeda and ISIS. Did they want to arm their alleged enemies? Or did they just accept it? Is there a difference, finally? And the Free Syrian Army, insofar as it actually existed as a coherent entity, contained many right-wing elements. The mainstream press now acknowledges that right-wing sectarians dominate the opposition, but this has been the case for some time. Nir Rosen, who spent months researching the war, goes further. “There are no actual moderate insurgents either ideologically or in terms of their actions,” he writes. Indeed, many FSA fighters have joined ISIS and al-Qaeda. The United States claims it has now ditched what’s left of the FSA in favor of its own proxy army. As the US teams up with Arab countries to train fighters, its policy on Syria resembles its policy on Afghanistan in the 1980s. American officials would argue that ISIS is the target of this force, but regime change remains the chief goal of their partners, and in any case the result is clear: continued warfare and continued shattering of Syria. The US now seems to favor a de facto partition that would destroy the territorial integrity of the Syrian state. As for the makeup of the new proxy force, President Obama has repeatedly pressed Congress to exempt his war on ISIS from the ban on financing torturers and other war criminals. While it’s quaint that he feels the need to acknowledge the Leahy Law, his doing so indicates the kind of force the US and its allies will be sending into Syria. “Clean” fighters are hard to come by, they say. No doubt. But the truth is that, like their Afghan Mujahideen-supporting predecessors in the 1980s, American officials probably want to unleash the most ruthless killers. And in several years, once the force our government built has merged with ISIS and slaughtered American civilians, we’ll all rally around the flag, lament the “sickness” in Islam, and cheer as the bombs fall. David Mizner is a novelist and freelance journalist who focuses on war and peace, human rights, and the security state.